Quail Forever completed 1,805 wildlife habitat projects and improved habitat for quail, pheasants and other wildlife on 202,630 acres in 2014. The organization – Quail Forever is Pheasants Forever, Inc.’s quail division – maintained a high level of efficiency, spending 90.42 cents of every dollar raised directly on its wildlife habitat conservation mission. 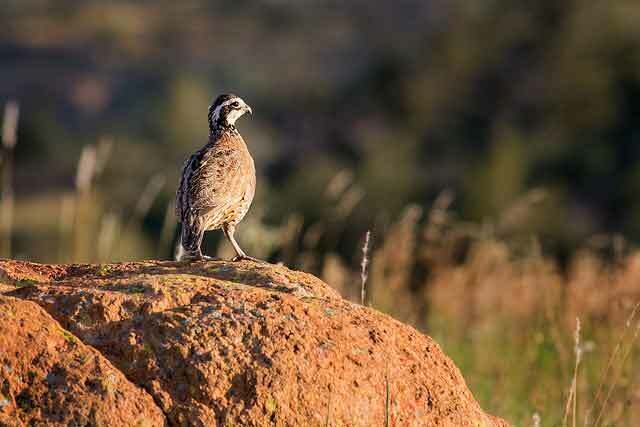 Howard Vincent, Quail Forever and Pheasants Forever President and CEO, says the organization’s grassroots model continues to be the driving force behind these upland habitat successes. “Membership, volunteerism and chapter involvement continue to lay the groundwork for successful upland habitat projects. Even as our impact grows, we remain true to accomplishing these projects with as little overhead as possible.” Due to its efficiency and effectiveness, “The Habitat Organization” continues to be recognized as a 4-star non-profit by Charity Navigator, the largest charity evaluator in the country. In 2014, Quail Forever membership rose to 13,567 and 23 new chapters were organized, resulting in a current total of 144 chapters in 26 states. Quail Forever also added two regional representatives to its staff to service chapters in Tennessee, Mississippi, Alabama, North Carolina, South Carolina, Oklahoma and Texas. Quail Forever chapter habitat projects – nesting cover, upland & wetland restoration, food & cover plots, maintenance, and land acquisitions – accounted for 202,630 acres of improved wildlife habitat in 2014. Quail Forever and Pheasants Forever chapters held 1,115 youth events in 2014, which attracted 65,000 youth participants, a new organizational record. Chapters hosted youth hunts, sponsored shooting teams, helped with youth pollinator projects, and held family field days in their communities. A new federal Farm Bill was finally passed in 2014, and its conservation title addressed some of Quail Forever and Pheasants Forever’s top wildlife habitat priorities, including a regional “Sodsaver” provision, reauthorization of the Conservation Reserve Program, crop insurance linked to conservation compliance and a new Agricultural Conservation Easement Program. Quail Forever joined with the Florida Fish and Wildlife Conservation Commission, the Georgia Department of Natural Resources, and Tall Timbers Research Station to form the Florida/Georgia Quail Coalition – a unique partnership to enhance habitat in quail focus areas. The new Florida/Georgia Quail Coalition will also help start Quail Forever chapters in both states to raise funds for quail management and monitoring, as well as youth shooting sports and education. Pheasants Forever, Inc. is a 501(c)(3) charitable organization. Pheasants Forever’s Annual Report is available online. Quail Forever’s Annual Report will be published in the Spring 2015 issue of the Quail Forever Journal of Quail Conservation.